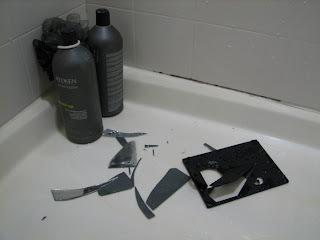 ... but look what happened in the shower tonight! I've NEVER broken a mirror before, this was definitely a first. To top it all off, it's Alex's, so hopefully he won't be TOO mad. I was just resting my head on the wall underneath the shower head, while the relaxing hot water poured over my neck, and BAM! My elbow moved an inch too far, I heard a crash, opened my eyes, and saw just what had happened. So, now I've broken a mirror and Mercury's still in retrograde (see here, here, or here for more on that one)... things aren't looking too good at all. I just hope the coming days don't spell disaster for me! Who has a mirror in the shower? Awkwaaard. It was Alex's. I think he used it to shave.